Companies are still remaining cautious about hiring staff on a permanent basis and temporary roles and contracts have seen a particular sore in popularity, particularly suiting seasonal employment (Christmas, Summer Sales etc. ) Temporary employment can suit people for many reasons particularly those in the interim of finding something more permanent where both employer and employee are happy where they stand on a temp. contract. 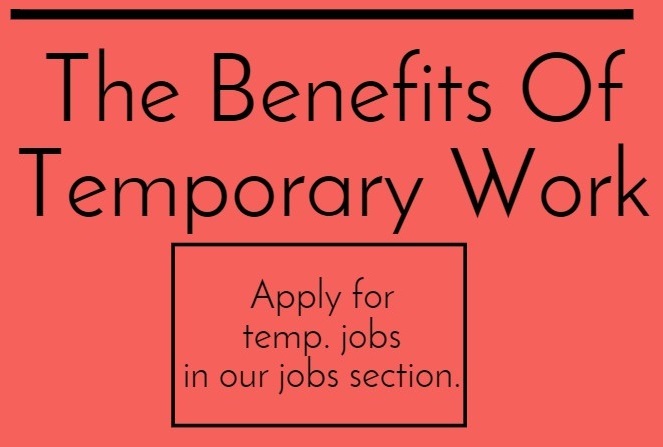 Here are a few reasons why temporary jobs can be of a major benefit to you. The most distinct and major advantage to temporary work is the flexibility it caters for. At all times you remain in control of your career and often it is easier to maintain the flexibility that daily life requires around this. It’s important to remember that as a temporary employee you still have rights and are entitled to benefits like sick pay, holiday allowance and regular pay. You are also required to be given the same quality of working conditions as your permanent colleagues. Unlike a more traditional role, temping can afford you with greater flexibility and control over your schedule. You can choose to work in short term, long term, or contract assignments to fit in and around your chosen lifestyle. Often employers can be overtly and unfairly critical of extended periods of unemployment. Keeping relevant skills fresh is imperative for career progression and taking on a temp. role allows for these to stay up to date and close any gaps in the interim. Maintaining a solid timeline of employment where possible can give you a competitive advantage in the job market. Temporary assignments may allow you to quickly learn new skills, be exposed to a range of systems and procedures, and trial different companies and industries to see what is right for you before committing to a permanent role. By spending time temping across various roles you can learn new skills and see how different companies operate, making you far more employable and really enriching your CV.